The Arkadelphia Public School District offers several programs designed to optimize child development from cradle to college and career. Hosted by Schools of the 21st Century, Parents as Teachers offers child development information and parenting support to families. The target age of the Parents as Teachers program is prenatal to age 3. 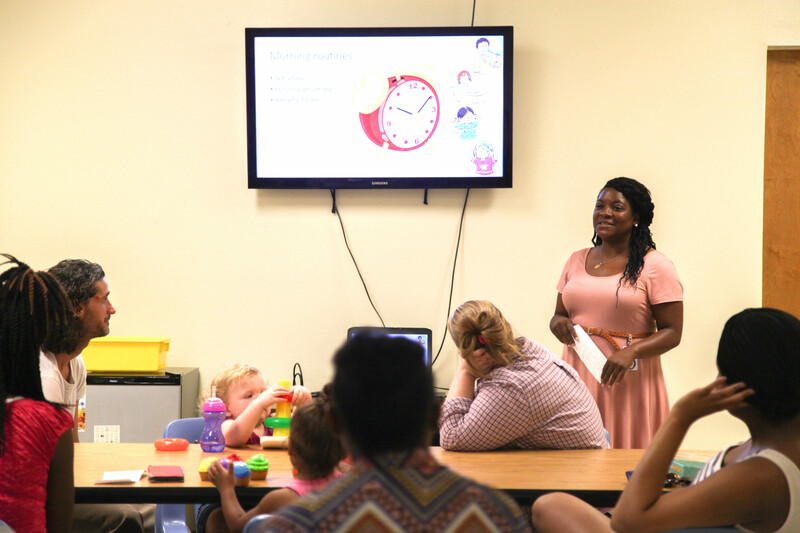 As a recruitment tool, Parents as Teachers hosts a Baby Safety Shower for pregnant mothers in the Arkadelphia area on the first Thursday of every month from 5:30 to 7 p.m. The Baby Safety Shower, sponsored by the OLDS Foundation and the University of Arkansas Children’s Hospital, is an injury prevention program that teaches expecting mothers about childhood safety. Each participant receives a complimentary car seat, along with electrical outlet covers, medicine cases, a thermostat for bath water, a fire alarm and several other safety items. Once a family enrolls in the Parents as Teachers program, they are able to participate in one-on-one home visits with a Parent Educator. Prior to the home visits, each family is given an assessment called the “Family Map”. This assessment helps the Parent Educator and family establish goals by identifying the strengths and weaknesses of the child, what areas the child needs improvement in, and what areas the child is performing well in. The goals of home visits are to “assess child and family needs”, “teach and guide the family”, “help families find support” and “refer families to resources”. Parents as Teachers also hosts Group Connection on the third Thursday of every month from 12 to 1 p.m. This meeting gives all the Parents as Teachers’ families an opportunity to come together, increase their knowledge on child development, share experiences and create a support system. Parents as Teachers Educators start each session with a lesson on a specific topic and provide a forum for families to openly ask questions and encourage one another. Our Parent Educators provide lunch for the families and encourage parent-child interaction through various activities. The Parents as Teachers Educators serve as a resource network for the families. Parent Educators monitor the child’s developmental screenings to ensure that their needs are being met. Parent Educators also refer families to other miscellaneous services such as job opportunities, food pantries and tutoring for parents who are college students or pursuing their GED. For more information regarding Parents as Teachers, contact Erica Bailey at Erica.Bailey@arkadelphiaschools.org, or Jo Anne Thomas-Buckley at JoAnne.Buckley@arkadelphiaschools.org.